Walter Payton graced the cover of Sports Illustrated many times during his career. This issue was released after he broke Jim Brown's rushing record in October 1984. The Bears opened 1984 in a new place-Platteville, WI. Coach Ditka needed his team to get away from any distractions they might face at home, and they spent August 1984 in the cornfields getting ready for the campaign ahead. The team was on the verge of discovering a group of young leaders for the first time, began to show the most dominating defense the league would ever see, and pushed much farther than anyone expected them to go. There would be no opening day letdown in 1984. Chicago started the season by throttling Tampa Bay 34-14. Then they blanked Denver 27-0 behind a huge day from Walter Payton. This game featured a famous image from Payton's career-a 50+ yard run down the sideline, led by 2nd-year guard Mark Bortz, an 8th round pickup that was converted from defensive tackle. The next week, with Jim McMahon out as the Bears visited Green Bay, reserve QB Bob Avellini took the reigns. Chicago could barely muster a bit of offense, but pulled the game out 9-7. This contest marked the first meeting of Mike Ditka and Forrest Gregg-a rivalry that would go down in history as the dirtiest era in Chicago-Green Bay football. The next week, the Bear's lack of offense really showed as they lost to Seattle 38-9. After this loss, Ditka cut Avellini. The move didn't matter the following week, and the Bears lost to still-powerful Dallas 23-14. A season that started so bright at 3-0 was becoming dimmer, as the team was suddenly 3-2. On October 7th, excitement was in the air as Walter Payton was poised to become the NFL's all-time leading rusher. Payton accomplished the feat early in the 3rd quarter, and the team derived inspiration from the great running back. They beat the Saints 20-7. They then lost 38-21 in St. Louis. Following this loss, they beat Tampa 44-9 in a blowout, and Minnesota at home, 16-7. Following the Minnesota win came the biggest challenge for the young Bears-a showdown with the world champion Los Angeles Raiders. Looking back, many point to this game as the Bear's pivotal win in their road to the super bowl under Mike Ditka. The Bears did indeed beat the Raiders 17-6, a game that showcased the NFL's leading sacker, Richard Dent, who collected three against Raiders QB Marc Wilson. This game wasn't all full of magic, however, as Jim McMahon was sanwiched on an ill-advised scramble, and the QB suffered a lacerated kidney, sending him to the sidelines for the remainder of the campaign. The team would now have to look to a new signal-caller to guide them to the promised land. Six-year veteran QB Steve Fuller had been acquired from the Los Angeles Rams prior to the '84 season for insurance in case McMahon was injured. The investment paid off. Fuller guided the Bears to a 2-1 record over the next 3 games. In the third at Minnesota's new HHH Metrodome on November 25th, the team clinched its first NFC Central Divison title. After the Minnesota game, Fuller was injured, and Chicago was faced with its most interesting quarterback problem ever. Ineffective Rusty Lisch replaced the injured fuller and lost the December 3rd game at San Diego, then started the following week against Green Bay at home. Lisch was again ineffective, so Ditka inserted none other than Walter Payton behind center in the shotgun formation. Not for lack of effort, but Payton was ineffective as well, and the Bears lost to the Packers 20-14. Fuller was expected to return by the playoffs, but Ditka didn't want to limp into the postseason with another loss. Ditka went to "plan Z", and signed 14-year journeyman Greg Landry to start his last NFL game against Detroit, which he helped the Bears win 30-13. Chicago was poised to enter the postseason for the first time since 1979. The first-round matchup sent the 10-6 Bears to Washington, a team that had played in the previous super bowl and lost to the Los Angeles Raiders. Washington was heavily favored, but Chicago came away with a 23-19 victory that featured TD passes from Fuller as well as Payton on a halfback option pass. The momentum was clearly in the Bear's favor as they travelled to San Francisco for their first appearance in a championship game of any sort since 1963. The line for the game came down steadily as the week wore on, but the Bears were humiliated 23-0. Fuller clearly gave no magic to the team in games against tough opponents, and the offense sputtered as the 49ers keyed to stop Walter Payton all day long. The team had gone farther than anyone gave them the chance to go in 1984, and the season set the stage for magic the following year. Quote of the Year: "If we keep playing the way we're playing, we're going to win this thing." -Walter Payton, following Bears' 3-0 start. Passing: Jim McMahon- As is well known, McMahon missed the final six regular season games and the playoffs with a lacerated kidney. He was on fire prior to the injury, finishing with a 97.8 QB rating. 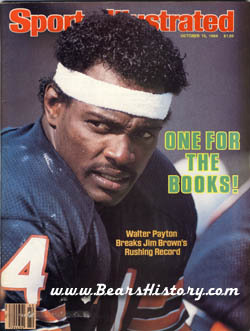 Rushing: Walter Payton- Simply the best. Payton rushed for 1684 yards, a 4.4 average, and 11 touchdowns. And he broke Jim Brown's rushing record. Receiving Yards: Willie Gault- Gault caught 34 passes for 587 yards and 6 touchdowns. Payton led in receptions with 45. Scoring: Bob Thomas- In his last season with the Bears, Thomas led them in scoring with 101 points. He was a respectable 22/28 on field goal attempts. Sacks: Richard Dent- Richard Dent burst on to the scene in his first year as a starter, leading the NFL with 17.5 sacks. Interceptions: Gary Fencik- Led the team with 5 interceptions from his free safety position. Jim McMahon started 10 regular season games prior to his kidney injury against the Raiders. He would play no more in 1984 after that. Steve Fuller started four regular season games and the playoffs. Rusty Lisch started against the Packers, Greg Landry at the Lions and Bob Avellini at Seattle. The offensive line took shape and began their first season of stability that would continue for many years to come. On defense, Richard Dent and Mike Hartenstine manned the defensive end positions and Dan Hampton and Steve McMichael were the tackles. Al Harris and Todd Bell were solid 1984 starters that would sit out the following season. From left to right, Offense: Jim McMahon, Walter Payton, Matt Suhey, Willie Gault, Dennis McKinnon, Jim Covert, Mark Bortz, Jay Hilgenberg, Kurt Becker, Keith Van Horne, Emery Moorehead, Bob Thomas. Defense: Richard Dent, Dan Hampton, Steve McMichael, Mike Hartenstine, Al Harris, Mike Singletary, Otis Wilson, Mike Richardson, Todd Bell, Gary Fencik, Leslie Frazier, Dave Finzer. Mike Ditka has made it well known in the years since his 1992 firing that he is a "Halas kind of guy, not a McCaskey kind of guy." Even in 1984, there were concerns that Michael McCaskey, in his second year as Bears CEO, would not give him a contract extension. (In 1983) it was no surprise to anybody that Ditka was not offered a contract extension by the regime that did not hire him. Ditka said he did not ask for an extension either, even if he thought he deserved one. McCaskey, preferring the strictly businesslike approach to his corporation, expressed the intention to withhold all action on Ditka's future until fourth quarter profits were counted, as it were. When the season ended, McCaskey would gather the evidence, consult his balance sheets, call a board meeting, take a vote, and come to a conclusion. All neat and tidy. This all made sense on paper. For a while, it all made sense in practice. Then something happened that few people could have foreseen: the Bears won the NFC Central Division title going away. They were dominating their division like no team since the 1976 Minnesota Vikings. It remains true that the Bears could fold at the finish and perhaps justify McCaskey's patience. But the overwhelming evidence is that the decision already has been made for him: he should rehire Ditka. The delay serves no purpose anymore. McCaskey did announce a contract extension for Ditka prior to the NFC Championship game loss. But this story offers interesting insight into future events. The Chicago Bears and Green Bay Packers met for the final time during the preseason in 1984. The game featured the first matchup, and near fisticuffs, of coaches Mike Ditka and Forrest Gregg. It apparently was not a good year between fans and Bear quarterbacks. Bob Avellini, a Bear for 10 seasons, was released following the Seahawk game, and he told the media Ditka told him it was because the fans ran him out of town. It was also reported that Jim McMahon threw his helmet at a fan following the home loss to the Dallas Cowboys. Walter Payton broke Jim Brown's NFL all-time rushing yards record against New Orleans. Following the game, he spoke to President and Mrs. Ronald Reagan from the locker room. The Bears won a "statement" game over the defending NFL champion Los Angeles Raiders on November 4th, with the defense terrorizing Raider quarterbacks. Unfortunately Bear starter Jim McMahon was lost for the season with a lacerated kidney. In response to this injury, the following season the NFL issued all quarterbacks "flak jackets" that covered the lower abdomen. These are still worn by all quarterbacks today. In a later game, backup quarterback Steve Fuller injured his shoulder while running the same play he sustained an injury while running in the preseason. Ditka said the Bears would never run the play again. Fuller's injury led to the elevation of third-stringer Rusty Lisch, who played horribly. It got so bad that Walter Payton lined up at quarterback in the loss vs. Green Bay. For the season finale, Chicago signed 38 year old Greg Landry to start. Fuller returned for the playoffs. In that season finale at Detroit, the Bears tied an NFL record by sacking Lion quarterbacks 12 times. This also set an NFL record for most sacks in a season with 72.